The total cost of Australian health care has grown about four per cent per year over a decade to $6248 per person, a report says. The Productivity Commission’s report on health services on Tuesday showed that the total amount government, individuals and private insurance spent on health grew from $4788 per person in 2004/5 to $6248 per person in 2014. Federal, state and territory expenditure grew from $3361 to $4284 per person in that time. This was not due to either inflation or population growth rates, which were both factored in to the results. Public health experts said the growth was driven by a range of factors, including medical advances, the ageing population and an increase in people suffering chronic illnesses. It comes as the fight over how health funding should be shared between federal, state and territory governments rages on, with NSW Premier Mike Baird pushing for a rise in GST to cover Abbott-era cuts to hospitals and schools. The commission found that government spending on GP care, public hospitals and mental health services had all grown between 2004/05 to 2013/14, with the total spend on health reaching about $154.6 billion in 2013/14. Federal funds for GPs rose from about $299 per person in 2012/13 to $312 per person in 2014/15. Federal expenditure on mental health services grew from about $169 per person in 2005/06 to $210 in 2013/14. This also rose for public hospitals during this time, from $1431 in 2004/05 to $1905 in 2013/14. The Australian Medical Association last week also warned that public hospitals face a funding “black hole” from next July, when the government plans to limit funding increases to population growth and indexation. Alison Verhoeven, the Australian Healthcare and Hospitals Association’s chief executive officer, said the Turnbull government should revisit this formula, as the report showed it was not suited to measuring the changes in demand for services. Tax reform also needed to ensure patients, particularly those with lower socio-economic backgrounds had good access to health services, she said. 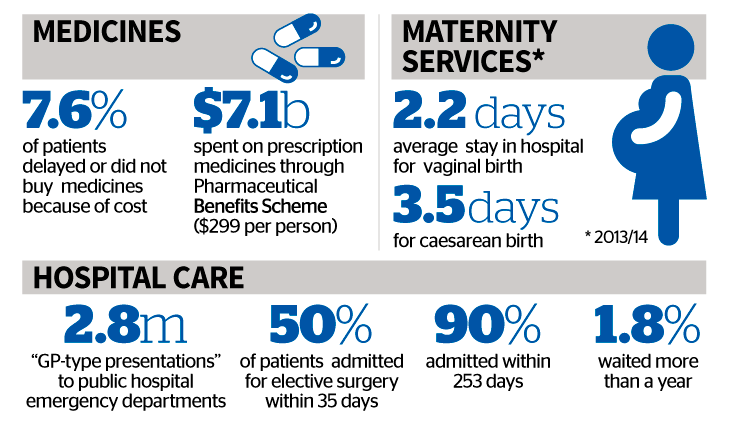 The Grattan Institute’s Stephen Duckett said that as the government invested more in health care, it also became more expensive as new drugs and medical diagnostic tools became available. Australians of all ages had increasingly gone to hospital over the past decade. “That’s not to say there’s not money being wasted in the health system…there are still opportunities for savings,”he said. The report also showed that there were fewer beds available in public hospitals and longer waits for elective surgery. 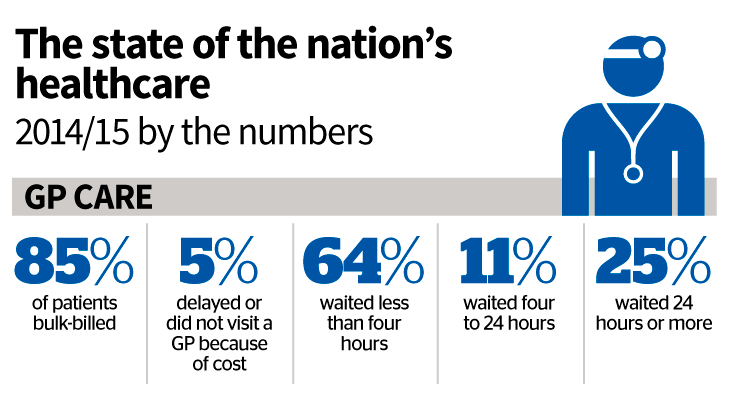 One in five people who saw a GP for any reason waited longer than they felt was acceptable to get an appointment. In 2004-05 there were 2.8 beds per 1000 people in the population, slipping to 2.5 beds in 2013-14. The proportion of patients who were seen on time within emergency departments improved slightly, rising from 69 per cent in 2005-06 to 74 per cent in 2014-15. Health Minister Sussan Ley said the government was working with states and territories to progress a series of health system reforms based on the Reform of the Federation White Paper. She said that funding for public health increases by around 21.5 per cent, or $3.3 billion over the next four years. Yet real expenditure on the pharmaceutical benefits scheme dropped from $7.9 billion ($350 per person) in 2011-12 to to $7.1 billion ($299 per person) in 2014-15. He said that over the forward estimates period, long-term growth remained about three per cent.